While we have been conducting experiments like lab rats in our lab (read Home ... we noticed, a few months back, a website called parivartan awards. 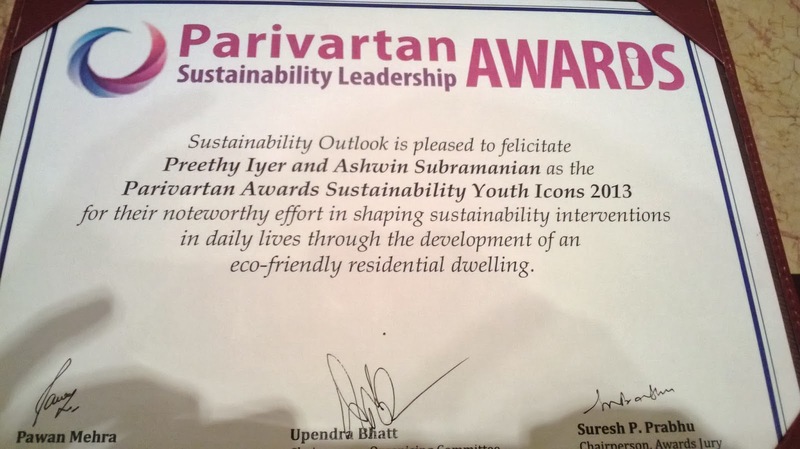 They recognize organisations and individuals who have done good work in the space of sustainability. They had called for entries for the awards for this year. So , we thought, maybe, all the water saving and waste management which we did @ home should count for something.... and completed the form and sent it right on the deadline. The awards were in October a good 2 months away and we got busy with our lives , then one fine day ( no not the movie, aah I love that one,though) we got a call from the organizers that we were one of the finalists it would be great if we could attend the awards ceremony, happening in Delhi. Since I was in Delhi on work that week, it was a good chance to experience being finalists (and the winning would definitely be the cherry on top). So, I decided to make it a lovely evening and invited my parents too for the event. As the event unfolded, various categories and their winner were announced. I was clapping happily, but was quietly nervous and simultaneously whatsapping (yes, it is now a verb!) my wife and partner in crime as events unfolded. She couldn't make it and was very eager to know what was up! Finally the category to which we had applied, which was "Sustainability Trailblazer" arrived and I saw our names on Nomination Board. That was an awesome moment. 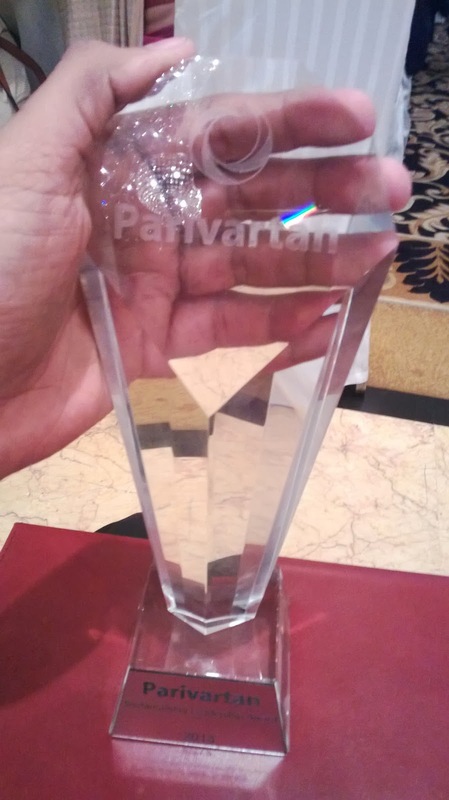 With bated breath, I wanted for them to announce the winners, and voila, it was us! 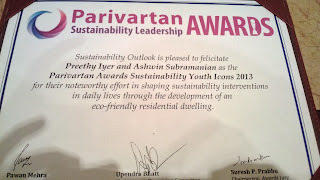 We were declared winners in the Category of " Sustainability Youth Icon, 2013 ". I hadn't won any award for sometime and it felt nice , the organizers asked me whose idea was it and like a dutiful husband I mentioned it was my dear wife. Preethy and I would also like to thank all of you who've been reading our blog and sending us encouraging feedback. If it was not for this, we'd probably not have come this far. So thank you!